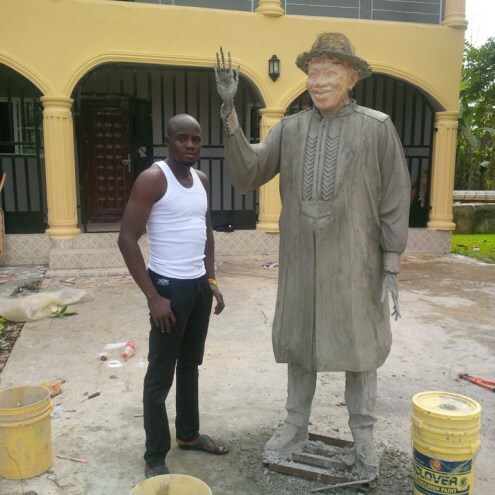 Ex-Corper To Donate Sculpture to Goodluck Jonathan - Corpr! Soon-to-be Ex-President, Goodluck Ebele Jonathan will soon have another sculpture of himself to add to his collection. Ex Corper Ezemagu Sunday Nnamdi had joined many others to raise some money for the president’s nomination form. Afterwards, he declared about two weeks ago that he would raise a sculptural piece in Otu-Oke, Bayelsa State, the home town of the President to honour him as a Hero of Democracy and also as one of his expiring political mentors. The picture above shows the yet-to-be-completed piece.